Spider-Ham's World: I Support Manny Pacquiao, the World’s No. 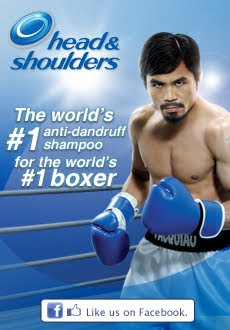 1 Boxer, just like Head and Shoulders, the World’s No. 1 Shampoo! I Support Manny Pacquiao, the World’s No. 1 Boxer, just like Head and Shoulders, the World’s No. 1 Shampoo! Why do I support Manny Pacquiao in his upcoming fight against Antonio Margarito? I think there are many reasons to tell. First, he is a pride of the Filipino people that brings honor to the country. He is the first boxer in the history to win 9 world titles in 7 different weight divisions. One good thing that happens when he has boxing matches, is that there is zero crime rate in the whole nation. This only shows that all people are all eyes on television sets, or all ears if you prefer listening to blow by blow details in the radio. This is one good thing the 'people's champ' does for the country. It's like he is making the world stop spinning while he exchanges punches with his opponent. He makes every Filipino people hold their breath as he fight for the glory of the country. So this Sunday, November 14, 2010, I will be one of the million people who will watch and support Manny Pacquiao in his fight against Antonio Margarito. Let's just hope Michael Buffer won't catch his breath when he introduces "Congressman Manny 'Pacman' Pacquiao". What I can only say now is I wish him all the luck against his opponent. wow! head and shoulders. dandruff=knocked out!